“Let’s Celebrate” is behind us! We thank everyone who entered our contests or helped with the judging, the luncheon, entertainment, raffle and the reception, which followed the show. We were pleased to have an increase in the number of entries in both the needlework and the crafts. We really didn’t have enough room (or time) to arrange the beautiful things - so we will have to make changes for next time. On our first celebration day (three years ago), we made the mistake of having the entertainment at 7:00 in the evening. This year (and last year) the show was presented at 2:00 PM - better for those attending, but almost impossible for us to all our judging and paperwork in that amount of time. We will meet with our State Lecturer and come up with some new ideas for 2010! The first place winning entries in the needlework contest will go on to the New England competition at the Big E in September. 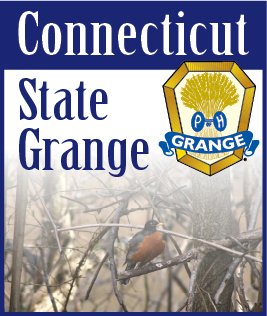 As usual, all of the entries in the craft contest will be kept by the State Committee to be donated to the sales room in the New England Grange Building or used as gifts for special guests at State Session. Participation for the second year of the Scrapbook Contest was up in numbers and the books were beautiful. Entries for the first year of the “Dress a Doll” contest were wonderful! Dolls were everywhere! Ribbons and prize money have been awarded to the winners. Class A - Afghans - 1- Barbara Cameron, Ekonk; 2- Wilma Diezel, Prospect; 3- Janet Degata, Hillstown. Class B - Doilies - 1- Cindy Anderson, N. Stonington; 2- Maryalice Lee- Cheshire; 3- Carol Nelson- Vernon; H.M.- Barbara Cameron, Ekonk. Class C - Embroidery - 1- Hazel Hallier, Watertown; 2- Edith Schoell, Manchester. Class D - Baby Set - 1- Norma DePietro, Glastonbury; 2- Edna Schneider, Harmony; 3- Maryalice Lee, Cheshire. Class E - Joan Ziegler, Redding; 2- Sue Addison, Winchester; 3- Genevieve Shippee, Killingly. Class F - Counted Cross Stitch - 1- Richard Bruchac, Trumbull; 2- Sandra Peterson, Lyme; 3- Mariellen Baxter, Vernon. Class H - Latch Hook - 1- Debbie Barnes, Stonington; 2- Dorothy Joselovitz, Redding; 3- Lois Evankow, Lyme. Class I- Quilted Wall Hanging- 1- Geraldine Strong, Vernon; 2- Doris Johnson, Old Lyme; 3- Karen Macdonald, Redding. Class J - Stuffed Toys - 1- Jennifer Shirner, Vernon; 2- Florence Mallone, N. Stonington; 3- Norma DePietro, Glastonbury. Junior Class - 1- Samantha Coulombe- Hillstown Jr. Dress A Doll - Junior - 1- Shannon Mathews, Hillstown Jr.; 2- Mary Burlette, Hillstown Jr.; 3- Colleen Mathews, Hillstown Jr.
1- Andrea Barlow, Totoket; 2- Diane Small, Manchester; 3- Masako Avery, Stafford; H.M.- Doris Shaw, Tunxis; Kathryn Ruff, Glastonbury; Dorothy Fairchild, Watertown. Needlework - 1- Beulah E. Partridge, Litchfield; 2- Edna Pressmar, Redding; Joan Ziegler, Redding. Junior - Other Media- 1- Abby Benito, Hillstown Jr.; 2- Alissa LaCasse, Hillstown Jr.; 3- Angelina DeDominicis; H.M. Mary Burlette. Junior Scrapbooking - 1- Alissa LaCasse, Hillstown Jr.; 2- Samantha Coulombe, Hillstown Jr.
Congratulations and thank you to each of the winners. We were especially pleased to see so many Junior entries this year. Needlework and craft winners will be shown at State Session in October. Be sure to come and visit the display.